Tuberculosis (TB) of the central nervous system (CNS) is a granulomatous infection caused by Mycobacterium tuberculosis. The disease predominantly involves the brain and meninges, but occasionally, it affects the spinal cord. Clinical diagnosis can be difficult; therefore, imaging has an important role in establishing the diagnosis (see the images below). Contrast-enhanced computed tomography (CT) scan in a patient with tuberculous meningitis demonstrating marked enhancement in the basal cistern and meninges, with dilatation of the ventricles. 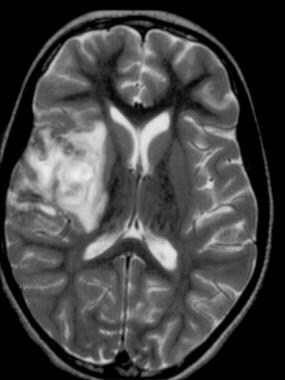 T1-weighted gadolinium-enhanced magnetic resonance image in a child with a tuberculous abscess in the left parietal region. Note the enhancing thick-walled abscess. Conventional MRI may cause early meningitis and early infarcts to be missed, and no MRI findings are pathognomonic for TBM. 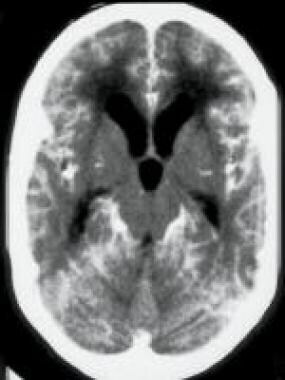 Diffusion-weighted imaging, if available, depicts infarctions in the hyperacute stage. Skull radiographic findings are usually normal. Rarely, in healed tuberculosis meningitis, faint parenchymal calcification is evident. Calcifications on skull radiographs in patients with healed TBM or healed tuberculomas are nonspecific findings. Skull calcification may indicate choroid plexus, pineal, and/or habenular calcification. 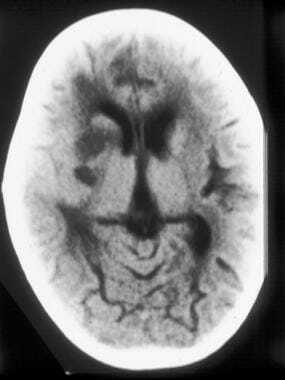 Single photon emission CT scanning with hexamethylpropyleneamine oxime (HMPAO) can be used to assess the degree and extent of cerebral ischemia resulting from TBM cerebral vasculitis. Findings are specific only for diminished cerebral perfusion. Although not currently in routine use in patients with CNS TB, cerebral angiography demonstrates findings of vasculitis. These findings include vascular irregularity, vascular narrowing, and vascular occlusion. Vessels commonly affected include the terminal portions of the internal carotid arteries, as well as the proximal parts of the middle and anterior cerebral arteries. Features of vasculitis and/or vascular occlusion are detected in other inflammatory and ischemic cerebral conditions. For excellent patient education resources, visit eMedicineHealth's Infections Center and Brain and Nervous System Center. See also eMedicineHealth's patient education articles Tuberculosis and Brain Infection. In tuberculosis meningitis (TBM), contrast-enhanced CT scanning of the brain depicts prominent leptomeningeal and basal cistern enhancement. With ependymitis, linear periventricular enhancement is present. Ventricular dilatation (eg, dilatation of the third and fourth ventricles) due to hydrocephalus is usually seen. Often, low-attenuating focal infarcts are seen in the deep gray matter nuclei, deep white matter, and pons; these infarcts result from associated vasculitis. The primary differential diagnoses are fungal meningitis, bacterial meningitis, carcinomatous meningitis, and neurosarcoidosis. CSF analysis often helps in establishing the diagnosis. Basal cistern and meningeal enhancement are seen in the first 2 images below. Vasculitis-associated infarcts are seen in the third image. Contrast-enhanced computed tomography (CT) scan of a child with tuberculous meningitis demonstrating acute hydrocephalus and meningeal enhancement. Extensive infarcts of the right basal ganglia and internal capsule after the appearance of vasculitis in the thalamoperforating arteries in a child treated for tuberculous meningitis. Parenchymal cerebritis may cause hypoattenuation with little or no enhancement. Parenchymal tuberculomas demonstrate various patterns. Noncaseating granulomas are homogeneously enhancing lesions. Caseating granulomas are rim enhancing; if these have a central calcific focus, they may form a targetlike lesion. Granulomas may also form a miliary pattern with multiple tiny nodules scattered throughout the brain. All lesions are surrounded by hypoattenuating edema. The differential diagnoses include fungal infections, bacterial infections, neurocysticercosis, and cerebral metastases. 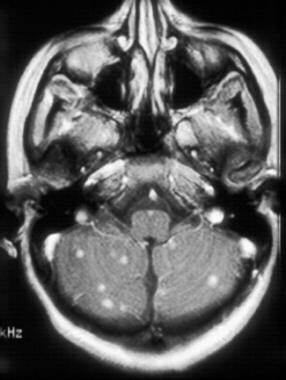 Cryptococcal meningitis also occurs in patients with acquired immunodeficiency syndrome (AIDS); however, the history is longer (ie, months) than that of TBM, and perivascular cysts are often seen in the region of the basal ganglia. Perivascular cysts do not occur with TB. Toxoplasmosis usually causes a focal abscess in patients with AIDS. T2-weighted magnetic resonance image of a biopsy-proven, right parietal tuberculoma. Note the low–signal-intensity rim of the lesion and the surrounding hyperintense vasogenic edema. T1-weighted gadolinium-enhanced magnetic resonance image in a patient with multiple enhancing tuberculomas in both cerebellar hemispheres. 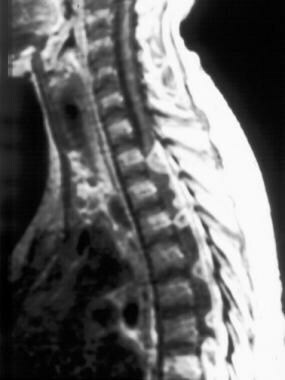 T1-weighted gadolinium-enhanced magnetic resonance image of the thoracic spinal cord in a patient with acquired immunodeficiency syndrome (AIDS) and leptomeningeal tuberculosis. Note the numerous granulomas on the dorsal surface of the cord and the dural enhancement. 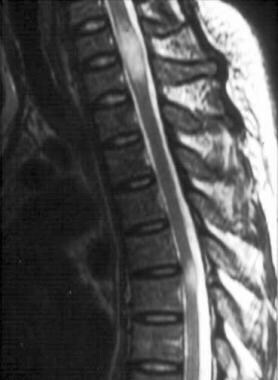 T2-weighted magnetic resonance image of the thoracic spinal cord of a patient with 2 hyperintense intramedullary tuberculomas. 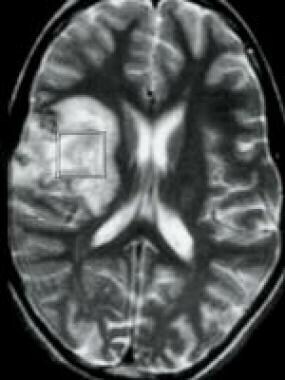 T2-weighted magnetic resonance image of a patient with a tuberculoma in the right parietal lobe. Parenchymal cerebritis may show hyperintensity with little or no enhancement on T2-weighted images. Parenchymal tuberculomas demonstrate various patterns. They are typically hypointense on T2-weighted images, but they may be hyperintense as well. 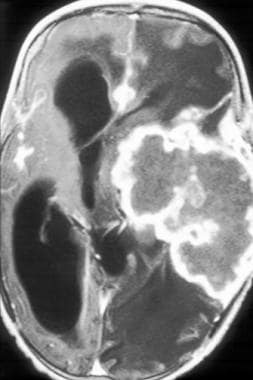 Tuberculomas, like bacterial cerebral abscesses, have hypointense walls or rims on T2-weighted MRIs. The cause is unknown, but free oxygen radicals released by the inflammatory process are believed to decrease T2 values. Noncaseating granulomas are homogeneously enhancing lesions. Caseating granulomas are rim enhancing. Granulomas may also form a miliary pattern with multiple tiny, enhancing nodules scattered throughout the brain. Lesions are typically surrounded by hyperintense edema on T2-weighted images. The differential diagnoses include fungal infections, bacterial infections, neurocysticercosis, and cerebral metastases. MR spectroscopy with a single-voxel proton technique can be used to characterize tuberculomas and differentiate them from neoplasms (see the image below). Tuberculomas show elevated fatty-acid spectra that are best seen by using the stimulated-echo acquisition mode technique and a short echo time. The necrosis of the waxy walls of mycobacteria within the granuloma is believed to cause the elevation of fatty-acid peaks. The lactate peak is caused by anaerobic glycolysis and is found in inflammatory, ischemic, and neoplastic lesions of the brain; this finding is nonspecific. 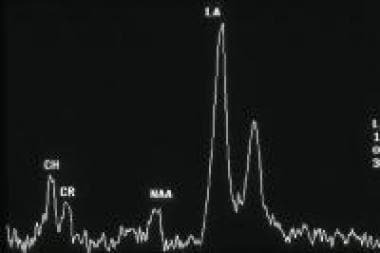 Proton spectroscopy trace of a patient with an intracerebral tuberculoma demonstrating an elevated lactate peak (LA) with diminished N-acetyl aspartate (NAA) and choline (CH) peaks typical of an inflammatory mass in the brain. MRI is especially useful in detecting leptomeningeal involvement of the spinal cord; cauda equina; and intramedullary tuberculomas, which, although rare, can be detected in patients with AIDS. Gadolinium-based contrast agents have been linked to the development of nephrogenic systemic fibrosis (NSF) or nephrogenic fibrosing dermopathy (NFD). For more information, see the Medscape Reference topic Nephrogenic Systemic Fibrosis. The disease has occurred in patients with moderate to end-stage renal disease after being given a gadolinium-based contrast agent to enhance MRI or magnetic resonance angiography scans. NSF/NFD is a debilitating and sometimes fatal disease. Characteristics include red or dark patches on the skin; burning, itching, swelling, hardening, and tightening of the skin; yellow spots on the whites of the eyes; joint stiffness with trouble moving or straightening the arms, hands, legs, or feet; pain deep in the hip bones or ribs; and muscle weakness. Garg RK, Malhotra HS, Gupta R. Spinal cord involvement in tuberculous meningitis. Spinal Cord. 2015 Sep. 53 (9):649-57. [Medline]. [Full Text]. Hwang JH, Lee KM, Park JE, Kim HG, Kim EJ, Choi WS, et al. Atypical Cerebral Manifestations of Disseminated Mycobacterium tuberculosis. Front Neurol. 2017. 8:462. [Medline]. [Full Text]. Thirunavukarasu SC, Ramachandrappa A. A rare case of intramedullary tuberculoma: Complete resolution after medical treatment and role of magnetic resonance imaging in diagnosis and follow-up. Asian J Neurosurg. 2012 Oct. 7(4):223-6. [Medline]. [Full Text]. Sankhe S, Baheti A, Ihare A, Mathur S, Dabhade P, Sarode A. Perfusion magnetic resonance imaging characteristics of intracerebral tuberculomas and its role in differentiating tuberculomas from metastases. Acta Radiol. 2013 Apr 1. 54(3):307-12. [Medline]. Srikanth SG, Taly AB, Nagarajan K, et al. Clinicoradiological features of tuberculous meningitis in patients over 50 years of age. J Neurol Neurosurg Psychiatry. 2007 May. 78(5):536-8. [Medline]. Smith AB, Smirniotopoulos JG, Rushing EJ. From the archives of the AFIP: central nervous system infections associated with human immunodeficiency virus infection: radiologic-pathologic correlation. Radiographics. 2008 Nov-Dec. 28(7):2033-58. [Medline]. Semlali S, El Kharras A, Mahi M, Hsaini Y, Benameur M, Aziz N, et al. [Imaging features of CNS tuberculosis]. J Radiol. 2008 Feb. 89(2):209-20. [Medline]. Botha H, Ackerman C, Candy S, Carr JA, Griffith-Richards S, Bateman KJ. Reliability and diagnostic performance of CT imaging criteria in the diagnosis of tuberculous meningitis. PLoS One. 2012. 7(6):e38982. [Medline]. [Full Text]. Sangani SV, Parikh S. Can sonographic measurement of optic nerve sheath diameter be used to detect raised intracranial pressure in patients with tuberculous meningitis? A prospective observational study. Indian J Radiol Imaging. 2015 Apr-Jun. 25 (2):173-6. [Medline]. Sanei Taheri M, Karimi MA, Haghighatkhah H, Pourghorban R, Samadian M, Delavar Kasmaei H. Central nervous system tuberculosis: an imaging-focused review of a reemerging disease. Radiol Res Pract. 2015. 2015:202806. [Medline]. Shih RY, Koeller KK. Bacterial, Fungal, and Parasitic Infections of the Central Nervous System: Radiologic-Pathologic Correlation and Historical Perspectives. Radiographics. 2015 Jul-Aug. 35 (4):1141-69. [Medline]. Torres C, Riascos R, Figueroa R, Gupta RK. Central nervous system tuberculosis. Top Magn Reson Imaging. 2014 Jun. 23 (3):173-89. [Medline]. Tyner HL, Baddour LM. 26-Year-Old Man With Nausea, Delirium, and Fever. Mayo Clin Proc. 2016 Oct. 91 (10):e137-e141. [Medline]. [Full Text]. Tai MS, Sharma VK. Role of Transcranial Doppler in the Evaluation of Vasculopathy in Tuberculous Meningitis. PLoS One. 2016. 11 (10):e0164266. [Medline]. [Full Text]. Janse van Rensburg P, Andronikou S, van Toorn R, Pienaar M. Magnetic resonance imaging of miliary tuberculosis of the central nervous system in children with tuberculous meningitis. Pediatr Radiol. 2008 Dec. 38(12):1306-13. [Medline]. Appenzeller S, Faria AV, Zanardi VA, Fernandes SR, Costallat LT, Cendes F. Vascular involvement of the central nervous system and systemic diseases: etiologies and MRI findings. Rheumatol Int. 2008 Oct. 28(12):1229-37. [Medline]. 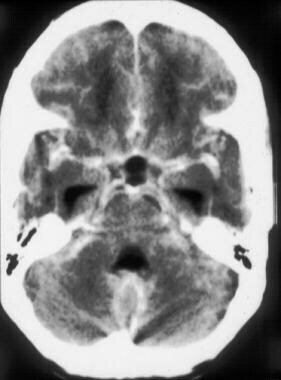 Petechial hemorrhages in the subcortical white matter of the brain as a result of tuberculous meningitis–associated vasculitis.